Backsplash mosaic of mountains and a tree using tiles of light colors brings serenity to a rustic kitchen. 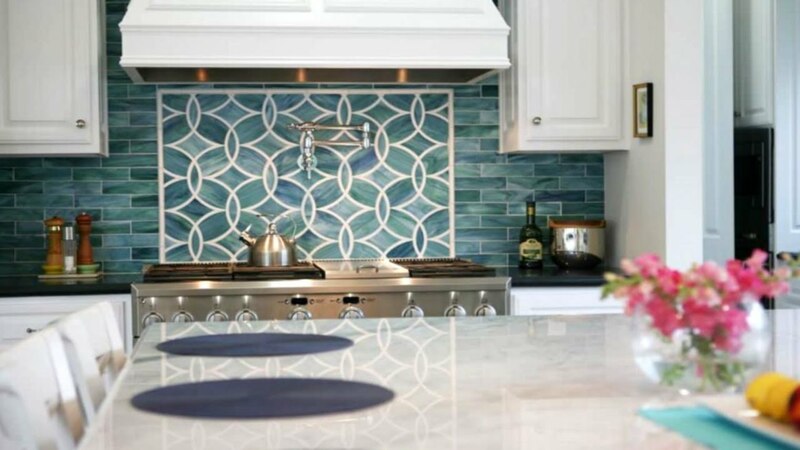 The light colors of the mosaic backsplash is the perfect accessory to rustic cream and white colored cupboards and a wood grain counter top. The whole theme feels light and airy and is just perfect to display white ceramic kitchen storage containers for spices and the like. Let's talk color. A kitchen with pink painted walls and rustic turquoise cupboards is an ideal accompaniment to a backsplash made of tiles with different designs and colors. Like puzzle pieces, the differently designed and colored tiles fit together to form such a unique backsplash. 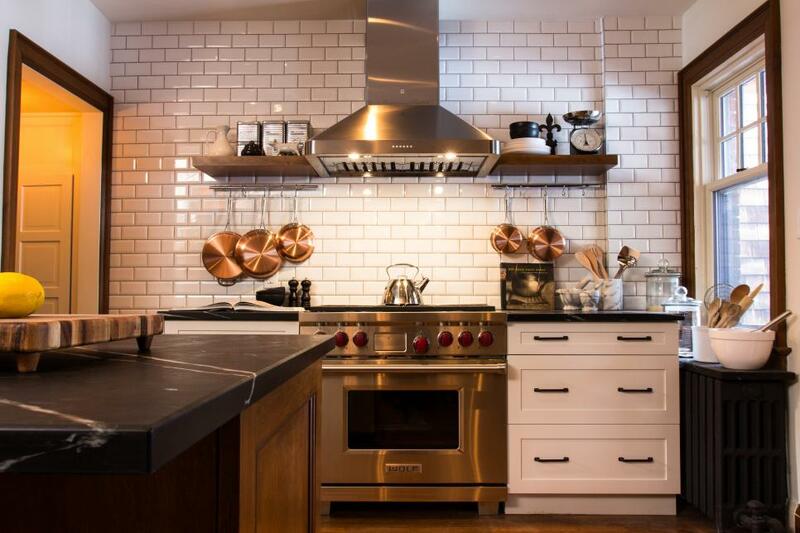 Best of all, anyone could make that kind of backsplash with leftover tiles from other projects. All the colors present could, most certainly, lift the mood of the individual cooking. A stainless steel backsplash would certainly look like it belonged in a modern kitchen with dark counter tops and faux wood cupboards and cabinets. Contrary to the knowledge that dark colors evoke negative feelings, this kitchen feels homey and can make an individual feel relaxed. Perfect to display stainless steel kitchen utensils and goes really well with the stainless steel oven and the oven top ventilation. What would compliment black granite counter tops and dark wood grain cupboards? A rock mosaic backsplash of course! Round rocks of different shades are gathered, smoothened, glued and fitted together make the perfect backsplash for that opulent but serene feel. Add to that a red backdrop and anyone would have their perfect kitchen. Wood grain cupboards and grey granite counter tops would work well with a wine cork backsplash. Not only is the very idea of a wine cork pattern for a backsplash unique but the color hue of the corks compliments the wood grains of the cupboards. It lends well to appliances or canisters that is either metal, shiny in nature, or dark toned, like dark blue or black. 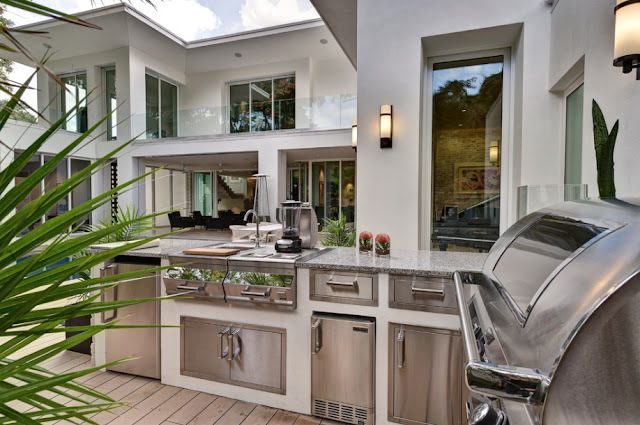 The whole scheme makes the grey granite counter tops pop. Breaking sea of pale wood grain window shade and island counter top and white cupboards and counter tops, the pale blue sky and cloud painted backsplash is quintessential. The light scheme goes with any appliance the owner would wish to display on the counter such as coffee maker or juicer. This design overall exudes tranquility that to whoever would cook within the kitchen's walls would enjoy it. In contrast to the white cupboards and white granite counter tops, the stencil of a profound quote with a black background and white writing backsplash highlights the meaning of the words themselves.Add a few more pieces such as white flowers in a shiny bucket that serves as its vase and dark washed candelabras on the window sills and the space is very cozy. Plus pleasing to the eyes. A perfect accompaniment to faux wood grain cabinets and white granite counter tops is a four shade tile backsplash. Made from tiles of the same side but of white, cream, grey and black hues not necessarily making any pattern at all, the backsplash is the perfect backfrop to shinning appliances such coffee makers and oven toasters. Also to metal containers for spices and what not. How about a white kitchen with white cupboards and white granite counter tops, a grey sink and a shiny metal faucet but the backsplash is made from recycled Sk8 tiles stuccoed together? A recycled sk8 tile comes from old or damaged skateboards that are essentially untreated but turned into tiles. The recycled sk8 tile backsplash provides the cascade of color that is an artwork in itself. A kitchen with white cabinets, an old style stove and faux wood grain counter tops deserves a wood pallet backsplash.The backsplash is made from wood buffed wood pallets that are washed and treated, and are perfectly fit together like puzzle pieces for a continuous wall. Ideal for displays of antiques ceramics like plates or containers such as cookie jars. The combination just gives the space a rustic, country feel.